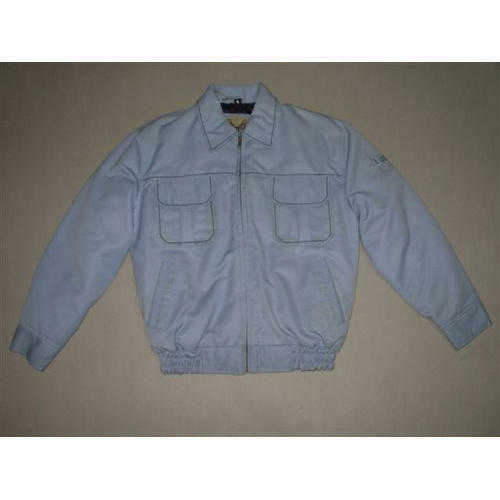 We are successfully ranked amongst the top manufacturers, exporters and suppliers of excellent quality Twill Jackets. These are fabricated using cotton flannel, durable brass zipper and genuine suede leather collar to provide utmost comfort to our clients. Our products are widely appreciated for their excellent quality, superior fabric, attractive designs and perfect stitching. Himsheel International is a family based professionally organized young team of entrepreneurs totally involved in manufacturing a wide range of Men Jacket, Ladies Jacket, Home Poufs, Carpets and Rugs, since 1992. Our products have a discrete and selective, by and large satisfied clientele in U. S. , E. U. , Australia, Africa, South Africa and Gulf Countries, since 1991. Backward integration with own tannery and complete in-house production processing helps us to maintain a very short lead period and makes our customer feel comfortable while working even on a very short notice. We can produce 8000 to 10,000 pcs on p. m. basis. We have a young well equipped and committed team taking care of minute details. We believe in extending personalized attention to each one of our valued customers. This practice has assured us repeat and regular business in the past. We have appropriate designing, sampling expertise backed by latest Indian and imported machinery, which ensures proper, consistent finishing. In order to have a zero defect production our working is based on TQM and on in put, pricing part on "JIT" and invariably our esteemed customers find an all round satisfactory product at very competitive terms and conditions.